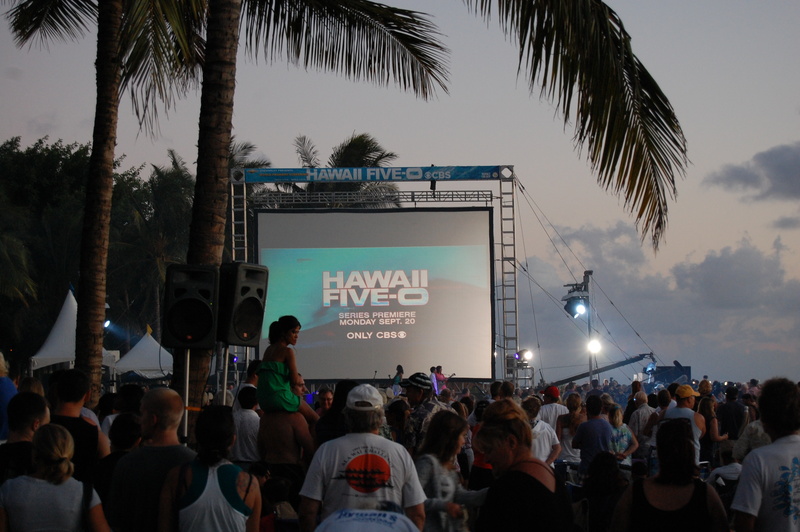 Last week we skipped the first Monday Night Football game of the season for something potentially more epochal: the local premier of the new Hawaii Five-O at Sunset on the Beach. Arriving too late to get anywhere remotely close to the red carpet, let alone an unobstructed view of the screen, we nonetheless enjoyed a shared excitement with fellow members of the peanut gallery. An endless procession of government figures, old cast members and producers crossed the stage for the poorly choreographed hour leading up to the actual screening, attempting to build up the crowd while downplaying their hunger for the show to be a success, providing long-term stimulus for an economy that desperately needs it. From this perspective, the new Hawaii Five-O already has more in common with Magnum P.I., the show that followed the old Five-O as a major network show filmed on location in Hawaii, in that it also follows in the big footsteps of the iconic, long-running series Lost. It debuted well, but did not quite meet expectations for the heavily promoted debut that it was, and did not even match the audience of previous year’s CSI: Miami premier which aired in the same time slot. It is hard to judge a show from its premier episode. Although it was easy to appreciate the locally shot scenes and cultural references while watching from the cooling evening sands of Waikiki, the narrative development seemed rushed, scripted, and cobbled together from too many used pop culture templates. Time will tell if they can even it out and discover the magic formula. We were up at Waimea Bay in March and saw them filming the scene where the boys meet Grace Park’s character for the first time. At the time I didn’t know what they were filming, but I noticed one of the actors walk by me in the toilets as we were leaving for the day. It turned out to be Daniel Dae Kim, the massively famous actor from Lost. I’ve never seen the show, and, not knowing who he was, barely glanced in his direction and left to rally the family for the drive back south. (Only days later did I discover my “brush with fame”.) What I found amusing when I finally watched the scene they shot that day was that as the Grace Park character surfs toward shore she gets tangled up with a “tourist” who drops in on her wave (and then punches him out – happens all the time). Just the idea of a tourist even trying to surf at Waimea… well, it’s television, isn’t it?